In the shadow of the LA 2028 President, Gene Sykes was none the less one of the major architects, particularly with regard to the communication and marketing strategy. 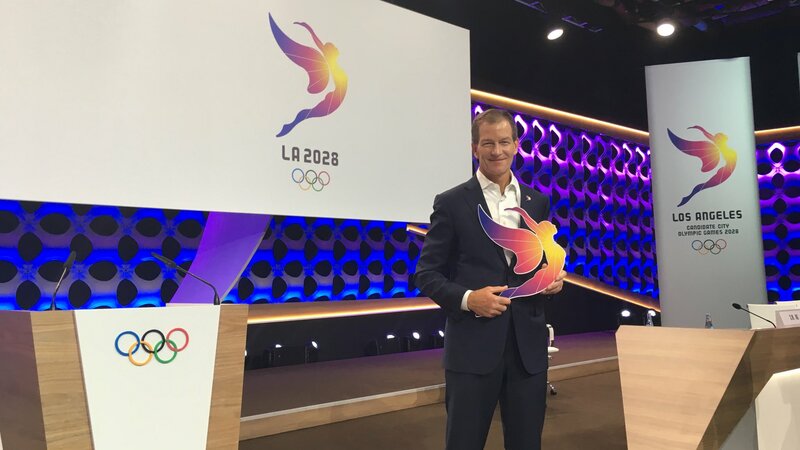 Today, when the International Olympic Committee (IOC) has just announced the Chairmen of the Coordination Commissions, the CEO of LA 2028 has agreed to answer the questions of « Sport & Society ». After two years of an unprecedented Olympic campaign, Los Angeles was officially named Host City of the Games in 2028, on September 13th. A month after the IOC decision, what is your state of mind today ? When IOC President Thomas Bach held up the card with “LA 2028” on it at the IOC Session in Lima last month, we made history in bringing the Games back to the United States for the first time in a generation, and back to a city that truly loves them. One month later, the emotion is still palpable in the City of Angels. What are the important steps for LA 2028 ? Our first step was to celebrate with the people of Los Angeles. So on our first day after returning from Lima, our entire staff along with Olympians and Paralympians went to Gates Street Elementary School to rebuild the school’s garden and help organize youth sports clinics for hundreds of LA students. Then LA 2028 and Mayor Eric Garcetti participated in a huge “Celebrate ‘28” parade at the Los Angeles County Fair. 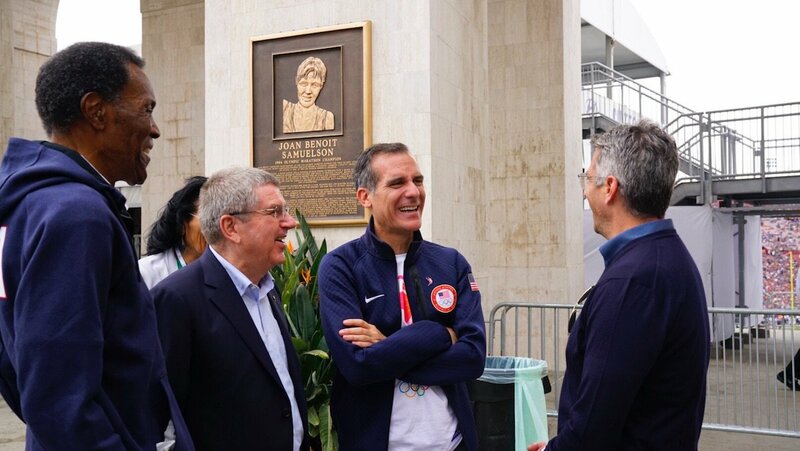 And we welcomed IOC President Thomas Bach to the LA Memorial Coliseum as we witnessed Olympic icon Rafer Johnson light the cauldron prior to a Los Angeles Rams NFL football game. And then we invited President Bach to meet with the LA City Council and Mayor Garcetti at City Hall. Moving forward, we have begun our transition to an organizing committee, and we’re starting our process of building an organization that someday will be able to scale up to employ thousands of Angelenos and mobilize tens of thousands of volunteers. We will also begin looking at how we will invest up to $160 million to expand youth sports programs in the City of Los Angeles in the years leading up to the Games. Because with our new agreement with the IOC, our legacy starts today. Finally, we will begin our work on our commercial and sponsorship programs. In the past, the organization of the Games in the United States has made extensive use of private sponsors. How does Los Angeles 2028 intend to attract future partners over the next few years ? The USOC has very good relationships and experience working with American companies to sponsor Team USA and we look forward to collaborating with them to ensure we can privately finance the 2028 Games. Los Angeles and Paris have entered into a partnership with the Olympic Movement. What is the current status of your exchanges ? First, we congratulate Mayor Hidalgo and the Paris 2024 team on their successful campaign and we look forward to working with them in the years ahead. Just last week, Mayor Hidalgo and Mayor Garcetti signed a memorandum of understanding that provides areas for collaboration. What priority projects have been identified, given that 97% of venues exist or will be temporary ? Since our Games Plan requires no new permanent venue construction, we have an unprecedented 11 years to focus on ways of revolutionizing the Games experience for every athlete, every fan and every Angeleno. We also have 11 years to focus on delivering a legacy for our city, not only after 2028, but in the years leading up to the Games. This begins with the significant investment we will be able to make in youth sports programs in the City of Los Angeles, thanks to the IOC’s financial support. This summer, in an interview with « Sport & Society », Casey Wasserman mentioned that « the agreement with the IOC allows us to deliver a legacy even before the Games begin ». In concrete terms, what actions do you intend to take from 2018 until 2028 ? With the IOC’s financial support, we will invest up to $160 million in youth sports programs in the City of Los Angeles in the years before the Games – bringing an Olympic legacy to our city right away, rather than waiting 11 years for the Games to end. We believe that sport can not only make LA the healthiest city in America, but can have other positive impacts as well. Sport is a great teacher. It has the power to instill teamwork, self-discipline, and respect. Sport provides young people with structure, purpose and support networks. Sport changes lives. In September, the USOC expressed interest in the expiry of the 2026 or 2030 Olympic Games. What is your view of the current process and what advice can you give American cities interested in bidding ? The Salt Lake City 2002 Winter Games were a wonderful celebration for our nation and the world and we know the United States would again be a great host for future Winter Games. As enthusiastic supporters of Olympic and Paralympic Movements, including winter sports and the Winter Games, we will look forward to discussing a winter bid with the USOC if they choose to pursue it.